Question: Provider adoption of Electronic Health Record (EHR) systems has increased significantly in the past three years, primarily due to Meaningful Use and PQRS mandates. However, recent reports conducted by the American Medical Association (AMA) seem to show that providers are overwhelmingly unhappy with their systems. Are providers REALLY unhappy with their EHRs, if so, for what reason? What can we do the change it? Answer: The recently released report by the AMA identifies low EHR satisfaction scores among physicians as compared to a similar survey they conducted 5 years earlier. However, I wouldn’t get concerned. At the same time, Black Book Market Research conducted a similar survey that yielded very different results. When comparing the two surveys, it is easy to see why they disagree. The variance between the two has caught the attention of the Healthcare IT Community and Healthcare Informatics (HCI), Medscape, and Health IT News have all reported on the differences. The American Medical Association completed a study in conjunction with AmericanEHR Partners in 2014, “Physicians Use of EHR Systems 2014.” The survey findings were recently reported and only 34% of the respondents were “Satisfied” or “Very Satisfied” with their EHR. The report presented by the AMA concluded , “ While findings show physicians generally expressed no desire to return to paper record keeping, they are concerned that cumbersome EHR technology requires too much time-consuming data entry, leaving less time for patients.” The survey was completed by 940 respondents and included 155 questions. The AMA reported that their survey sample was selected by both the American College of Physicians and the American Academy of Family Physicians. They stated, “Each society was allowed to select the population of their members to receive the survey. Therefore, the survey went to both users and non-users of EHRs.” The survey was computer based and used skip-logic to only ask questions that were relevant to the taker. Additionally, the survey allowed respondents to skip questions if they were unable to answer. All respondents were counted equally regardless of the stage of EHR implementation. The overall sample tended to lean toward smaller practices and included solo practitioners. This was the second survey performed by the AMA on provider satisfaction. An initial survey completed 5 years earlier indicated that 62% of providers were satisfied with their EHR at that time. In contrast to the AMA survey, Black Book Market Research also completed their Annual EHR Satisfaction Survey in 2014. The recent report identified improved physician EHR satisfaction since the previous period. The survey showed that 67% of physicians were satisfied with their EHR Experience, 63% were satisfied with physician documentation and 68% were satisfied with product enhancement. All three categories scored 10% or less satisfaction in the same survey performed 3 years ago. Black Book surveyed over 27,000 EHR users for the study. In addition, 6000 providers who have not completed EHR implementation were also surveyed, but those questions were counted separately. The Black Book Survey also had other significant differences. The survey represented a much larger proportion of large practices (10+ providers). It makes sense that larger practices might be more satisfied, as they typically have more resources, more clout when dealing with the vendor and are more likely to purchase a larger, more robust system. Solo and small practitioners were included in this survey as well. Among small practices who utilized a Cloud-Based EHR, satisfaction was very high at 81%, as reported by Black Book. It was noted that the Black Book survey did focus more on cloud based technologies. While it may seem as though we cannot really compare the data in the two surveys, lest we compare apples and oranges, some valuable data did come from both surveys. There were two areas in which both surveys appeared to yield the same results. The first and most significant is that satisfaction improves with time. In both surveys, satisfaction among providers who had used their system for less than 3 years was far below those who had used their system for over 5 years. Interestingly, this may explain some of the more negative results from the AMA survey, particularly considering the sample selected. Between 2010 and today the number of EHR users has increased significantly, which means, so has the number of new users. So if respondents in all stages of implementation were to be counted equally, it could be assumed that they would have lower satisfaction scores. The second area where both surveys agree is that size does matter. Larger practices, as noted previously are more satisfied with their overall EHR experience. In addition to the already identified benefits for the larger practices, they also are more likely to be affiliated or employed by a healthcare system. This results in two other big satisfiers when it comes to EHR; reducing most or all of the financial burden associated with purchase and more advanced interoperability with inpatient and ancillary services. Both surveys identify that financial burden is a definite dissatisfier, while effective interoperability increased overall satisfaction. One would be hard pressed to find a person who would not think that this frame work is ideal; maybe even utopian. And there lies the problem. There is an unrealistic expectation from many of our providers. It is the expectation that “it will make your life easier” and “make your patients’ lives better”. It’s the message that was presented early on when we were still trying to get physicians to adopt EHR systems. Since then, our message has changed, but for many, the expectation has not. Realigning expectations with the realistic efficiencies of our technology is a start. Better assessment of the user environment pre-implementation can also help paint a more realistic picture of what the EHR transition will mean for users. We should strive to meet the components of the framework to improve satisfaction, but be readily clear as to what the limitations are. Did Providers Cause Their Own Dissatisfaction? After the AMA report was released, Black Book actually commented on the differing results. One of the points made by Black Book was that smaller practices often purchased cheap or free EHR systems only to meet Meaningful Use or PQRS mandates. It conveys that the providers really did not think about the future, and only based their decision on what they had to do now. While some of that may be true, we can’t ignore the fact that this culture has been bred. It warrants the following point; current providers have witnessed CMS delays, patches, fixes, exclusions, hardships and modifications on pretty much every mandate that has been released. It does not bode well for credibility. So it is not surprising that some practices might not invest in an enterprise solution, not knowing if the mandates are permanent. Every legislative change means potential change to our providers and healthcare systems. The change is often disruptive and costly, impacting the smallest groups the most. The early bird may catch the worm… or he may just end up having to start over due to a last minute legislative decision (or non-decision). Regardless, I would guess that would be one unsatisfied bird. 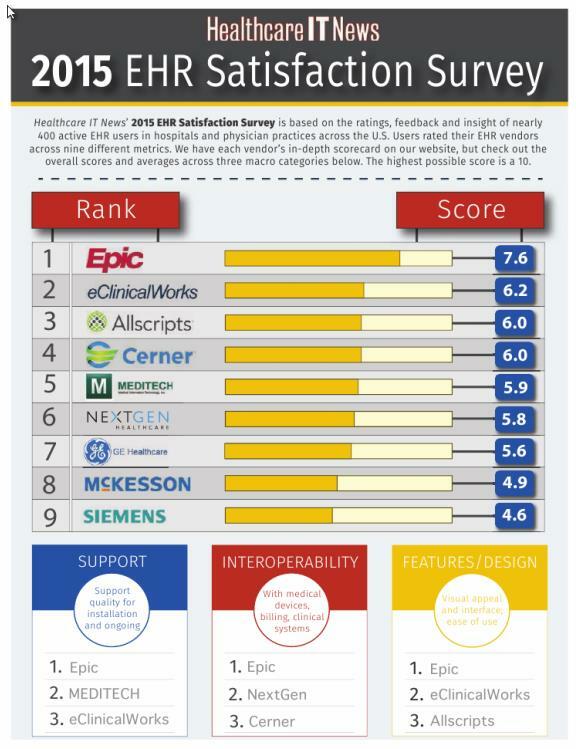 Healthcare IT News released their 2015 EHR Satisfaction Survey in the September Issue. The report was based on ratings by 400 active EHR users, both in the hospital and physician practice setting. Interpret results at your own risk.